Recent research into members of the Harache family of goldsmiths who left France in the 17th century and settled in London has revealed that a Peter Harache of Little Newport Street was dealing with Richard Hoare the banker between 1697 and 1705 (see note 1). According to E. Alfred Jones writing in The Burlington Magazine for Connoisseurs (see note 2) about casters made by him for Hoare, "In 1697 he made a set of 'the common sort with heads graved, 41oz. 19dwt'". He must then have been a working partner in the firm Pet; harache &c goldsmiths and it now seems that this firm too was engaged in banking, as David Willaume and other goldsmiths were, since an entry in the list of goldsmith bankers compiled by F. G. Hilton-Price in 1890-1 (see note 3) reads: "Harache, Peter, Goldsmith and plate-worker, of Suffolk Street, corner of Charing Cross, 1689-1706". The difficulty in determining which Peter Harache was engaged in which activity is that, although they worked as a company which was based at Great Suffolk Street, their activities are recorded under their individual names and there were three of them! Thus Jones was under the impression that the Peter Harache who had dealings with Hoare's bank was Peter Harache the younger, whose address was at Compton Street and who didn’t enter his mark until 1698, whereas the word 'younger' does not appear in the records held at the bank and as Peter Harache the elder was domiciled at Great Suffolk Street throughout this period it seems that the Peter Harache in question was Peter Harache III. The active large worker in the Harache workshop at Great Suffolk Street after 1697 was Peter Harache I and there are extant examples of his work in both museums and private collections around the world although a mystery surrounds them as most have been misattributed to Peter Harache II. The confusion arose because Sir Ambrose Heal claimed that Peter Harache I died in 1700 (see note 4), whereas his burial record is actually dated December 1712 (see note 5). In fact Peter Harache II came from a family of small workers and must himself have been a small worker. Both his younger brothers Abraham and John (John Harache I), who also came to England are known to have been small workers and both probably finished their apprenticeships under the direction of their elder brother since their father died before they had finishes their terms. That this was a family of small workers is not surprising as there appears to have been a division in 17th century France along religious lines with Catholics as silversmiths and Protestants as goldsmiths, the latter specialising in small wares like decorative boxes such as snuff boxes. Peter Harache I and David Willaume, both of whom were large workers, were therefore the exception rather than the rule! The only reason for believing that Peter Harache II, was a large worker is that he has had items of large work attributed to him as stated above, having entered marks in the large workers' register (see note 6) at Goldsmiths’ Hall in 1698, and this has led to acceptance that he was indeed a large worker although it now seems that these were misattributions. In 1703 he took Jacques Des Rumeaux as his apprentice and according to Grimwade the brothers John and Daniel Lefebvre were also apprenticed to him. All three entered marks as small workers on gaining their freedom! 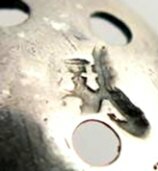 It has now become evident that early 18th century plate bearing the Harache workshop mark is struck with the mark of Peter Harache I which he registered in 1697 (see note 7). This is hardly surprising since Peter Harache II was in receipt of Royal Bounty from November 1714 which means that there were only twenty two months between December 1712 and November 1714 during which time work produced by the Company could have been struck with any mark other than that of Peter Harache I. Further, since Louis Mettayer became the rate payer at Great Suffolk Street after 1712, it seems likely that the Company was wound up on the death of Peter Harache I and that there would therefore have been no plate produced after 1712 on which any workshop mark pertaining to that Company could have been struck. It is a fact that dishes dated 1713 (currently at The British Museum), forming a set of six, are struck with Mettayer’s mark and this shows that the workshop at Great Suffolk Street was being used by him and not by the Company. On the other hand there are examples of small work such as a long tea strainer (mote) spoon and tea (sugar) tongs together with snuff and other miniature spoons of both sterling and Britannia standard which must be dated to the late 17th and early 18th centuries that are struck with marks both registered and unregistered that can be no other than the marks of Peter Harache II. (see below). The conclusion to be drawn from the foregoing is that Peter Harache II was not a large worker at all but, like his brothers and his own apprentices, had been trained as a small worker. He may well have worked with Peter Harache I at Great Suffolk Street (or at Compton Street as an outworker) as a member of the Harache Company, as his younger brother Abraham probably did, but in the capacity of a small worker. Further it has now been established that, as the Haraches traded as a Company, the large workers’ marks registered by them must be treated as 'workshop' marks so that Peter Harache II could have entered his large marks as alternative workshop marks which, in fact, were never used. 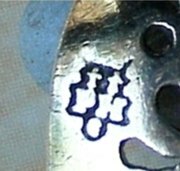 This is borne out by the fact that one of the four marks in the register against his name is offset and is much smaller than the other three and it is this mark that appears on small work of Britannia standard made by him and must be considered personal to him (see below)(see note 8). Thus as now seems likely, it will be found that Peter Harache II was a small worker and that all of the large work previously attributed to him must be that of Peter Harache I or at least struck with his mark, it is not surprising that the late Arthur Grimwade compared the former's work so favourably with that of the latter since it will have been shown that both were the inspiration of one and the same man! Grimwade attributed the engraving work found on pieces marked by Peter Harache I to Blaise Gentot and that on pieces attributed to Peter Harache II to Simon Gribelin and in view of the foregoing it seems likely that Gribelin (1661-1733) may have taken over from Gentot as the engraver to the Harache workshop on the death of the latter in 1700. If it is found that the post 1700 large work previously attributed to Peter Harache II was the work of the Harache Company and was struck with the mark of Peter Harache I as a workshop mark but that the engraving work on all post 1682 plate by the Harache workshop must be attributed to these two engravers then there can be little doubt that Gribelin did take over from Gentot. As it must now be accepted that the Haraches worked at Great Suffolk Street under the title ‘Pet; harache &c goldsmiths' (see note 9) and that the makers' marks appearing on their large work were workshop marks then it follows that all large work marked by them must now be attributed to Pet Harache &c goldsmiths and not to individual silversmiths. 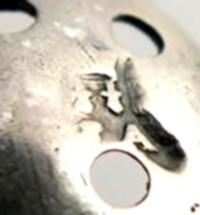 This in turn means that any sterling standard pieces therefore almost certainly bear the mark of Peter Harache III whilst any Britannia standard pieces bear the mark of Peter Harache I. Further it now seems that it must be accepted that Peter Harache II's marks, both registered and unregistered, are likely to be found only on small work! note 6: From the records at Goldsmiths' Hall it is not at all clear that large and small marks relating to one man were kept in separate registers at this time as they probably were by the mid 18th century. According to David Beasley (Librarian to the Goldsmiths' Company) "The method of entry in the early books does group the marks on one workman under his first entry". This suggests only one register which would account for both large (workshop) and small (personal) marks appearing together against the name Peter Harache junior. note 7: Images of marks have been sought from several museums and other sources but have not always been forthcoming. Examples of known misattributions are as follows: Sideboard Dish 1700 (Koopman Rare Art), Cup & Cover 1702 (sold by Christies in 2000), Methuen Dish 1703 (Ashmolean Museum), Wine Cistern 1704 (Worshipful Company of Barber Surgeons), Richmond Race Cup and Cover 1705 (sold by Christies in 2001).